Good morning! (Or afternoon. Or evening.) It’s Day 5 over at the 29 Faces Challenge. I am counting the profiles of these two as one face, which seems fair! Thanks for dropping in! Some progress pics, though I forgot to stop and do some scans while doing the background. 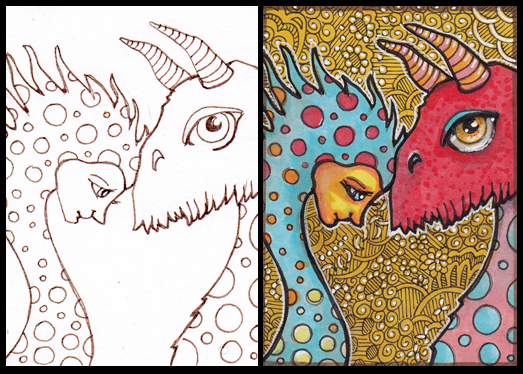 This entry was posted in ATCs and ACEOs, Copic Markers, Progression Photos and tagged 29 Faces Feb 2015 on February 5, 2015 by The Beast Tender. I would totally count that as two faces!! LOVE your amazing backgrounds – you never seem to get “stuck” with what to do next – I feel like I am always stuck! These are otherworldly indeed. excellent. And I love the step by step. Am loving your magical creatures! The colors an patterns are just wonderful! So much creativity… bravo! The gold back round is beautiful even without your sweet characters!